Share the view of bright planets, the Moon, and terrestrial targets through your telescope with friends, family, and fellow astronomy enthusiasts. With Orion's StarShoot USB Eyepiece Camera II, the whole family, classroom, or astronomical society can enjoy the view as seen through your telescope right along with you, as if you were all looking through the same telescope at once! The USB Eyepiece Camera II lets you view what you see in your telescope on your laptop or desktop PC for crowd-pleasing performance. The StarShoot USB Eyepiece Camera II fits in any telescope with a 1.25" focuser, or a 2"-to-1.25" step-down adapter. While a telescope attached to a mount equipped with a tracking motor will provide the best results for nighttime use, even non-motorized telescopes like Dobsonian reflectors work well with this petite performer. During daylight hours, the USB Eyepiece Camera II can add crowd-pleasing performance to any telescope outfitted for terrestrial use. Telescopic views of birds, wildlife, and scenery can be seen and enjoyed on your laptop or desktop PC screen. This fun and affordable camera provides a great entry into the rewarding realm of astrophotography. 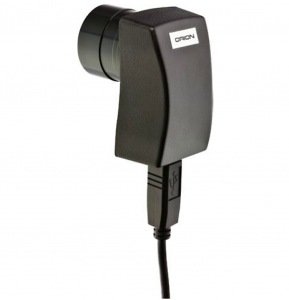 The StarShoot USB Eyepiece Camera II features a CMOS sensor chip with 8-bit output and RGB 24-bit color resolution. While not sensitive enough to capture images of faint deep space objects, the USB eyepiece enables you to share telescopic views of brighter objects within our solar system like the Moon and bright planets. The 1.25" nosepiece is threaded for use with any Orion 1.25" eyepiece filter, so you can enhance the view to your liking by using a Moon filter, light pollution filter, color planetary filters, and more (filters sold separately). You can also use our StarShoot 0.5x Focal Reducer (sold separately) if youäó»d like to view a wider area. The included Orion AmCap movie capture software allows you to save and process the views transmitted through the eyepiece. The StarShoot USB Eyepiece can capture up to 24 frames per second at its native resolution of 640 x 480 pixels, which is considerably higher than our original model. Progressive scan imaging means information from each and every pixel is delivered to your computer for each frame. The color CMOS sensor features small 5.6µ x 5.6µ pixels for great resolution on bright targets. All power is supplied to the StarShoot USB Eyepiece through its USB connection to your computer. Get a StarShoot USB Eyepiece Camera II today and start enjoying the Moon and planets of the night sky, and daytime terrestrial views through your laptop or PC!